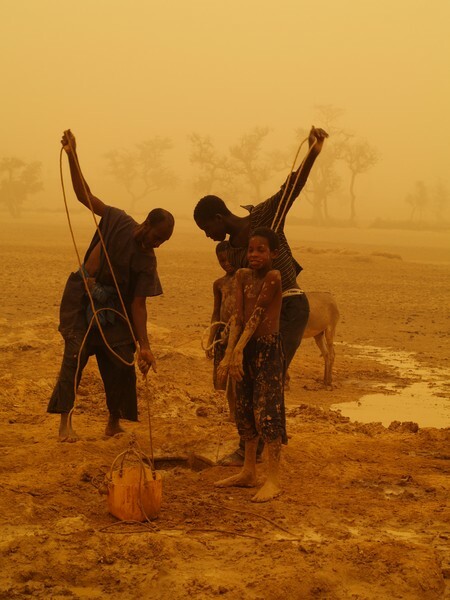 This picture was taken on Mali’s Dogon plateau during the dry season, in the course of a late sandstorm day. Between November and March, a hot, dust-laden Harmattan haze frequently persists over the whole of Western Africa. The Harmattan is a hot, dry wind blowing from the Sahara, carrying large amounts of dust and transporting it for hundreds of kilometers. Here, we see two men drawing water from a deep and narrow well excavated by hand. This latter is a task commonly carried out by children, who climb down to dig the well bottom. Mali has a low population density, most settlements are concentrated in the southern part of the country and along the Niger River, where the climate is less harsh and water availability is higher. In the north, Mali is arid and only those who raise livestock can make a living. One of the most important tourist attractions in Mali is the Dogon Plateau, which sits in the central part of the country, east of the Niger River. The plateau gently descends westward to the river valley and ends in abrupt cliffs on the southeast. These cliffs reach an elevation approaching 1,000 meters at Bandiagara, the main village of the Pays Dogon (Land of the Dogon). These geological, archaeological and ethnological interests, together with the striking landscape, make the Dogon Plateau one of West Africa’s most impressive sites. Ensuring the population has safe and sustainable access to water is one of the major challenges in the Sahelian region. Facing recurring drought events and encroaching desertification, Sahelian countries are currently heavily affected by climate change. Extreme rainfall events and high rainfall intensity are the main cause of soil erosion and land degradation. Consequently, high rates of soil transport can lead to reservoir siltation and the reduction of water availability for agriculture. To cope with these issues, traditional soil and water conservation (SWC) measures like hillside terracing, permeable rock dams, stone lines, earth basins, planting pits and earth mounds have been regularly employed in the Sahelian area. The Dogon Plateau is home to a broad variety of these measures, implemented to deal with the acute shortage of soil and water. As the population urgently needs support to preserve soil fertility and reduce soil erosion, SWC measures need to be improved and adopted more widely. However, most donors fund short-term projects without considering the maintenance that is needed to ensure SWC measures remain effective long-term. The first lesson is that there is much to learn from the traditional ways of doing things and SWC projects should always begin by looking at what the people are doing for themselves. Secondly, the international cooperation actors should set up long-term funding programs improving the participation and inclusion of local communities. The final goal would be to ensure the stakeholders are not permanently dependent on international aids. Water is life.The soil hold water on the ground.We need to establish ways of conserving the little water we have.Water harvesting need to be embraced.The water sources also need to be protected.The water we harvest will be used during dry seasons. Thanks for creating awareness.